Here’s some news that’ll brighten your day: you have the power to reduce the environmental impact of ALL your clothes, even if they’re not eco-friendly! Choosing sustainably-made garments made of fibers like organic cotton or recycled polyester is a great start. But did you know that laundering is still the largest contributor to a piece of clothing’s overall greenhouse gas footprint? Consider the total life cycle of a garment: the raw materials, manufacturing, shipping, to your at-home wear and care and ultimate disposal. 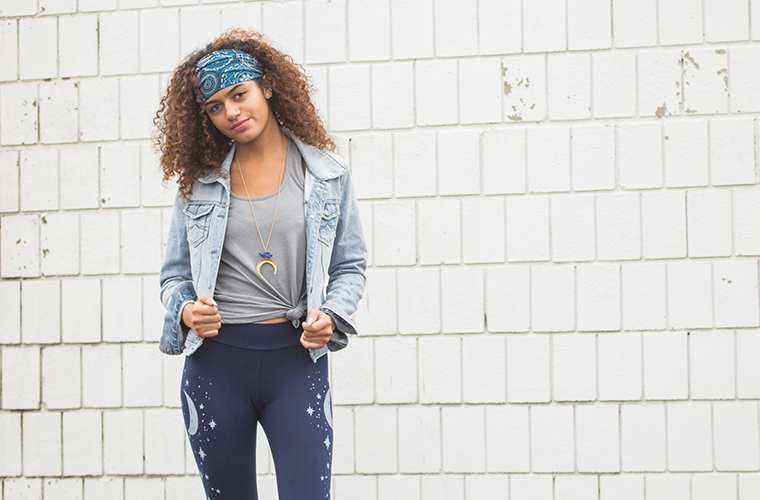 What you practice at home accounts for 40-80% of the garment’s total emissions. You can make a huge difference and green up your laundry practices! Wear clothes more times between washings. 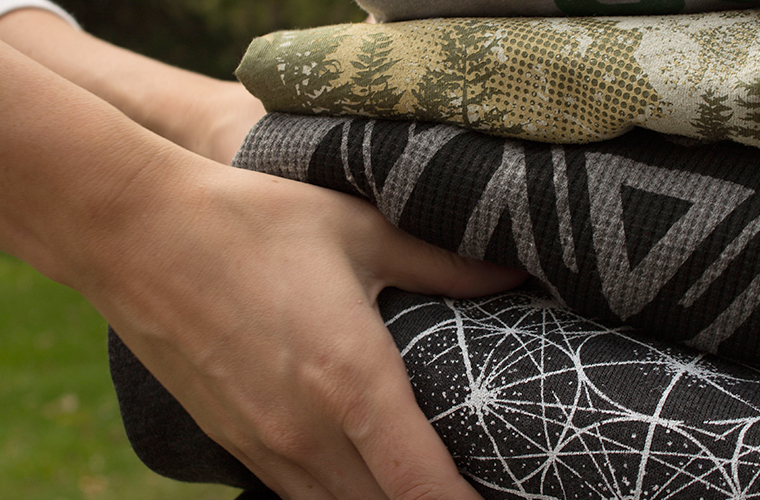 Looser fitting garments won’t absorb as much sweat, and natural fibers like organic cotton and hemp breathe well. 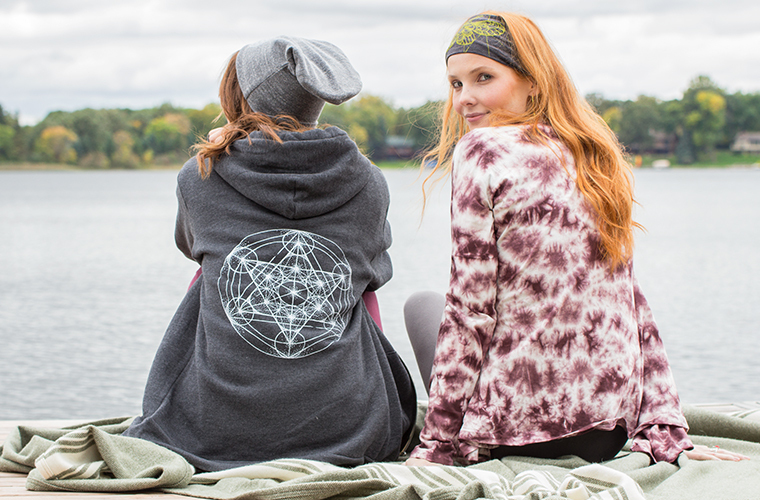 Hemp clothing is also naturally anti-microbial. A cotton garment made with a bit of spandex blended in will retain its shape better, so you can wear it more times before washing. Tip: Air out garments between washes, and fold or hang them up so you’re not throwing a t-shirt in the wash just because it looks wrinkly. The average American family washes about 300 loads of laundry per year, using up to 40 gallons of water per load! When you do laundry, only wash full loads to take advantage of all those gallons of water. Spot treat stains before tossing in the washer, instead of washing multiple times. Tip: Try natural spot removers on stains, like vinegar, lemon juice, baking soda, and salt. Washing in cold water cleans just as well as hot, and saves greenhouse gas emissions. Heating water accounts for about 90% of the energy needed to run a washing machine. Cold water can also make your clothes last longer: lower temperatures protect the dyes and help keep your clothes from shrinking. Tip: Hot water can actually set in stains, so cold water is best for removing them! Machine drying is the single largest cause of greenhouse gas emissions in the life cycle of a garment. The dryer uses 5 times more energy than washing, so line dry your clothes! 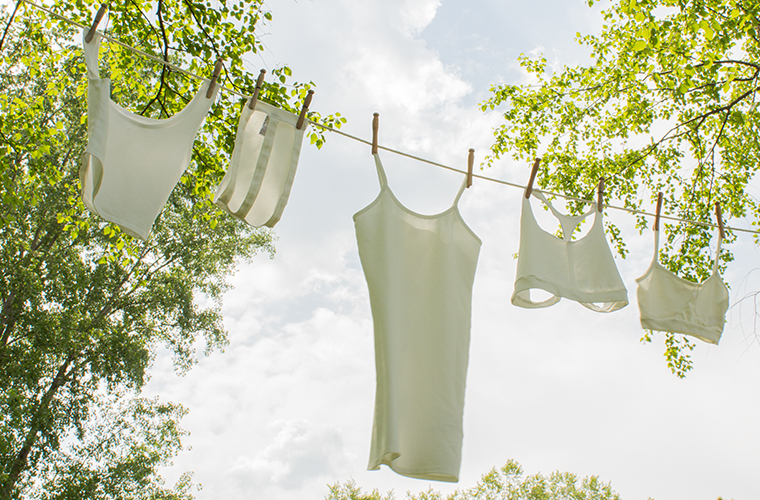 Skipping the dryer and ironing of your t-shirt can save 1/3 of your tee’s carbon footprint. Tip: Hang your knit t-shirts upside-down on the line to avoid crease marks on the shoulders! 5. Wear the heck out of your clothes! Americans buy an average of 64 items of clothing per year: that’s 1 item per week and then some! Of all the clothing sold each year, 85% ends up in landfills, thanks to the average American tossing in 70+ pounds. Extending the active lifetime of a garment by just 9 additional months reduces carbon, waste, and water footprints by around 30% each. I love this blog post. I honestly find that soul flower clothing seems to need less washing and I can wear the pants and tops for longer periods with out washing. The clothes honestly dry amazingly with out dryer too compared to other stuff that seems wrinkly or out of shape with out a dryer.